The White Acacia (Robinija) is a large tree that belongs to the legume family, are very often used in folk treatment of various diseases. The acacia has beautiful and spreading crown, the trunk of the tree visible longitudinal cracks. The acacia trunk is gray-black or gray-brown color. Shoots and young branches of acacia green and smooth. The leaves of acacia egg shape and are opposite on petioles in 7-21 pieces. The outer side of the leaves smooth and green, and the inside velvety gray-green color. The acacia flowers are white, fragrant and in racemes, which droop. 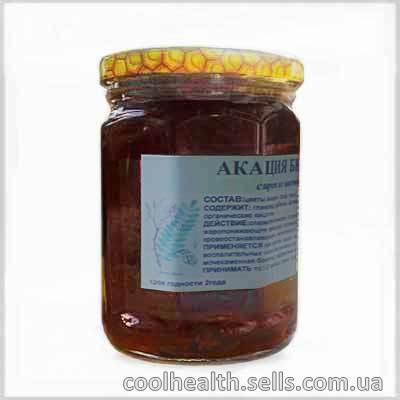 In folk medicine used a decoction of the bark of acacia, it helps the people who have acute gastritis or peptic ulcer disease. The young shoots and leaves are the raw material for the preparation of infusions taken during exacerbation of peptic ulcer disease and gastritis. Infusion and decoction of the flowers of acacia is used for kidney, bladder and rheumatism. The flowers are used, connecting them with the leaves of the common bearberry, flowers, common tansy, and blue flowers cornflower and licorice root. In many countries of the world acacia is officially considered a medicinal plant. Chemical composition of Acacia, and especially its fruit, is still not fully understood. The bark and flowers of acacia contains flavonoid robinin. This substance is hypoazotemic action – excretes urea. The Medicines Based on Robinia. However, this substance is toxic and, therefore, self-treatment of any disease with the help of acacia is dangerous and in any case it is necessary to consult a doctor. Acacia should be taken in moderate doses, because a large dose is poisonous. Bark of acacia is the most dangerous as it contains toxalbumin, which can lead to irritation of the mucous membranes. Acacia can't take people with low stomach acidity. When timber harvesting can occur following symptoms of malaise, nausea, vomiting, headache, drowsiness. The Syrup of Acacia properties. The Syrup of Acacia application. Due to its medicinal properties, black locust has long been used in folk medicine. Flowers are used more often and collect them when they blossomed only half, and the leaves and young bark during the warm season – spring, summer and autumn. Dosage: 1-2 tsp. 3 times a day.